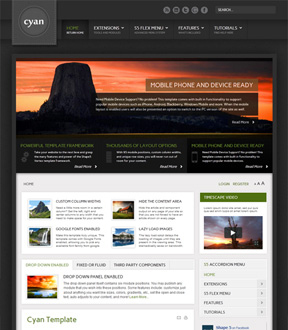 Enhance your site with the breathtaking Shape5 Cyan Joomla Template! Its dark, elegant shadows around the main body and header, contrasted with the lighter main body help make your content really stand out, and will give your site a very professional look. It comes with all the great features that you would expect in a Shape5 Vertex template including: custom highlight color, custom highlight font, 4 module styles, an amazing 95 module position, right to left language support, custom row widths, fixed or fluid layout, and so much more! In addition to a great looking template we have also stylized our frontpage display module and tab show module to match. Both of these modules are great additions to any site and allow you to easily organize your and dazzle your site's viewers.